The Greens’ latest proposal to legalise adult cannabis use will be widely welcomed. It is a very modest, sensible, and safe proposal. But it can’t hide the fact that The Greens are in deep turmoil. In New South Wales, the right wing challenge to David Shoebridge is underway. Cate Faehrmann, Di Natale’s former chief of staff, has successfully used the Federal Court to allow her to nominate for the parliamentary position being vacated by Mehreen Faruqi (when she replaces Lee Rhiannon). In South Australia, Robert Simms is challenging Sarah Hanson-Young for the top Senate spot. While, in Victoria, The Greens have begun their internal inquiry into the failed Batman by-election campaign to find the leakers responsible for, “backgrounding and leaking of sensitive and confidential party matters”. That won’t be pretty. Then Richard Di Natale landed himself alongside Tony Abbott, re-opening the debate about population by accepting that the argument to cut immigration “was worthy”. The struggle in the NSW Greens is the sharpest and will be the most decisive. But they are all indicative of the malaise that is engulfing The Greens nationally. Is the future of the party based on games in parliament or does the party explicitly shift left to focus on the unions, social movements and the struggle outside parliament? 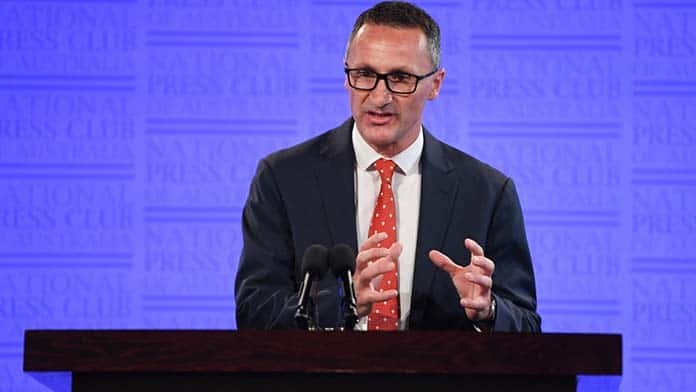 No doubt Richard Di Natale thought that his March National Press Club speech could re-invigorate The Greens and position them a little more to the left. But Di Natale made his determination to put parliamentary manoeuvres at the centre of Greens politics very clear: “We know that negotiating to improve government legislation can come at a political cost.” His efforts to strike deals with Turnbull over legislation like Gonski 2.0 have cost them support. But the cost is one that Di Natale willingly pays in the hope of one day being a serious parliamentary player. Di Natale put forward two main things in his speech, a Universal Basic Income (UBI) and a People’s Bank. They are designed to be headline, and hopefully vote, catchers. But the demands reveal a completely top down approach to politics. Neither demand connects with any existing struggle or is designed to generate one. Nobody believes that The Greens could actually implement such policies. So they seem to be just pie-in-sky demands that isolate them from the people they should be trying to connect with. Di Natale is left floundering. The proposal for the People’s Bank was designed to appear radical yet respectable at the same time. It was pitched as something that would, “inject some real competition into the banking sector”, around mortgages. It didn’t sound like anything that was going to end the rip-offs and the multi-billion dollar profits of the “Big Four”. The UBI proposal was panned by the right-wing press. But the fundamental problem is that it is completely removed from the kind of immediate demands that could strike a chord—like boosting Newstart, the single parent benefit and the aged pension. While The Greens may not be in any position to actually increase the dole themselves, posing such concrete demands can pressure the Labor Party and point to the kind of reforms that would make a substantial difference to those forced to survive on welfare. Similarly, at a time when a strong argument can be made to re-regulate and re-nationalise power generation to stop the rampant profiteering by the private power companies, Di Natale’s proposal was to, “re-nationalise parts of Australia’s electricity system, starting with the critical interconnectors between states.” Of course they should be re-nationalised but the demand does not connect with the urgency of bringing down power prices. The most striking aspect of the speech is that Di Natale made no mention of the issues that are front and centre of Change the Rules—the industrial demands that are affecting millions of workers. Di Natale’s speech came a week after ACTU Secretary Sally McManus’s turn at the press club. Di Natale had a fantastic opportunity to connect with Labor’s voting base and identify The Greens with the working class campaign that is going to dominate Australian politics between now and the election. The gap between what workers need and what Labor will offer is a gap that The Greens could fill with radical proposals well to the left of Labor. The limitations of Di Natale’s electoral vision for the future of the party are increasingly being displayed. Rather than looking to the centre, The Greens need to look to the left. The fight in NSW has ramifications for the whole party and the left in Australia.